Intermet Refractories are proud to be associated with various technological advancements in the renewable energy sector and, notably, the manufacture of engineered insulation components for use in modern waste to energy combustion units. Because of significantly lower calorific values associated with bio-mass fuels compared with fossil fuels, thermal insulation is a key to operational cost effectiveness. 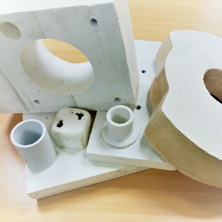 Intermet Refractories has a range of highly efficient insulating products which also allow final machining of components to tighter tolerances, thus, optimising installation/assembly operations. High quality insulation combined with better fit and finish of insulating components all contribute to increasing the overall efficiency of the system.